Open a new scene in Toon Boom Harmony, delete all nodes in the node view and save the scene. Open the "Xsheet" window and create a new column by clicking on the "Add Columns" button. Make sure its type is set to "Expression" and name it "myExpression". Double click on the title of the "myExpression" column to edit it. You can modify the output of an expression column by creating the variable "Value" and giving it an assignment. Here we are setting "Value" to 3. This has set every frame of the Xsheet for the "myExpression" column to 3. You can inspect the value of any cell in the Xsheet by clicking on it. 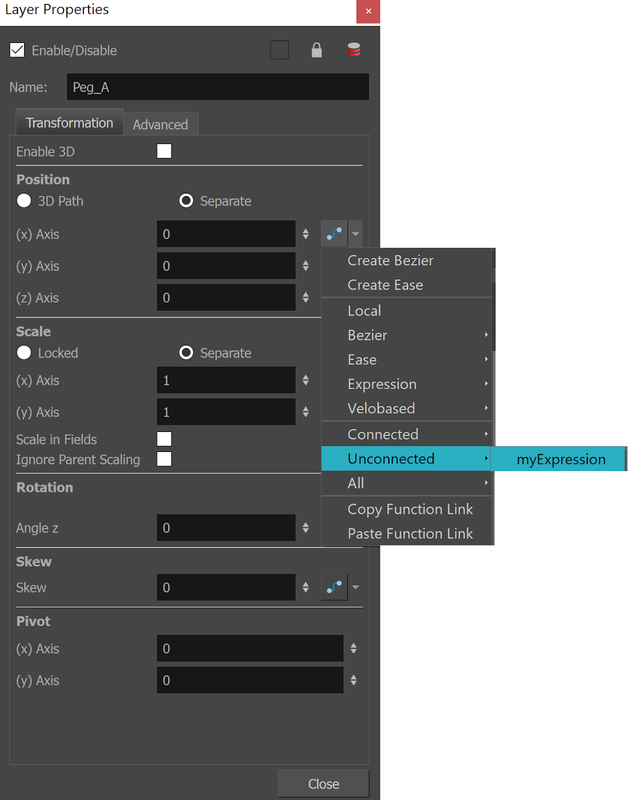 You can connect "myExpression" to an attribute by clicking on the drop-down menu next to the value of a specific attribute, go to "Unconnected" and you should see "myExpression" as the only option. When connected, the attributes value should show the name of the expression column it is connected to and its resulting value: "myExpressions" and "3 E" ( E & N are +ve and W & S are -ve of origin ). To get a expression we first have to send that inforation to the Xsheet so that it is readable by expressions in the Xsheet. First "Create Bezier" for value that you want to read. Then set that attribute back to "Local". 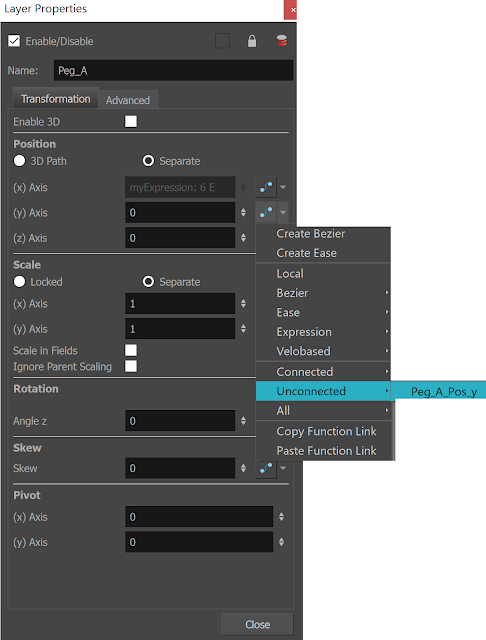 Now connect that same attribute to its original Bezier. We now have an attribute that updates as the peg is transformed, that can be renamed (very useful when your expressions get complex) and can be read by Xsheet expressions. Now create a drawing to attach under "Peg_A" so that we can make a tween on it. Make sure that the Xsheet information for "Peg_A_Pos_y" changes over time like below. We can now reference Peg_A's Y position information in our expression. We can access that reference with the simple function below which multiplies the referenced value by 2. Expressions do not calculate instantly. They will update after you release the mouse on a transformation. If you want to create a custom keyboard shortcut for a command that does not already exist in the shortcuts menu, the method it a bit more complicated but it is still possible. 1. You need to create a script that executes the command you want the shortcut to execute. 2. You need to edit the shortcuts file so that it includes a reference to the script you created. You can directly link attribute values of elements together. So that when any of the linked attributes are modified, they all are. I will demonstrate this by linking the x axis function of Peg_A with Peg_B. 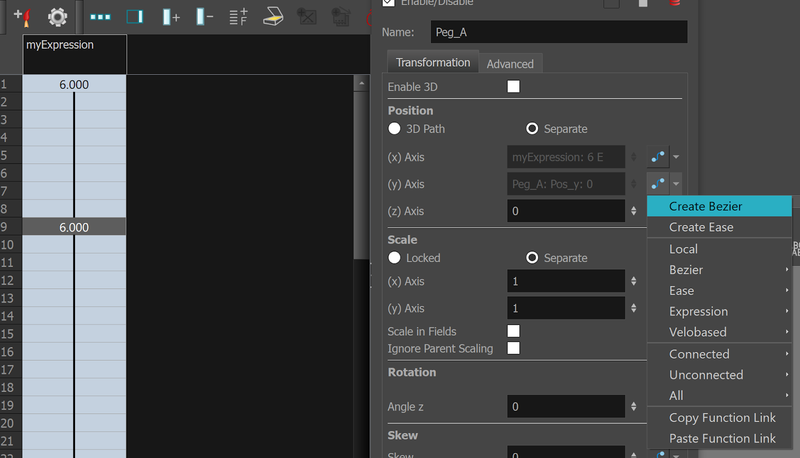 Go to the "Layer Properties" of Peg_A by clicking on the yellow square in its node in the node view or by selecting it and viewing the "Layer Properties" window. Make sure that the attribute you want to copy has been keyframed. If its value is greyed out and not selectable like above then you know it has a Function. If its value is "0" and editable then it has no function to be shared, it it just a static value. Now use the dropdown menu of the value you want to transfer to copy the function from Peg_A to Peg_B. The 2 values are now linked, so whenever one is modified, the other will react immediately.